Most people don't know why we have rain gutters specifically. For many, it's always been there and it's known that it's required to be there but beyond that it's a mystery. If you own your own home, you likely are VERY aware of the reason for these gutters- to stop the water from rolling off the roof in a collective downpour right on to the perimeter of the homes foundation. It forms a sort of water laser effect on the ground surrounding the overhang of your roof. Water can cause a trickle "pounding" effect that can destroy the ground. This slow slamming down over time can destroy your home's foundation. One good long downpour or months of rainy weather can be destructive to your foundation and cause a very costly repair. What a rain gutter does is safely allow the water hitting the roof to "drain" into the gutters and down to through channeled piping that leads to the ground. Without a system in place to displace and funnel the water you get what you see in the above image- a down pour of water that cuts deep into your grass/mud/perimeter. 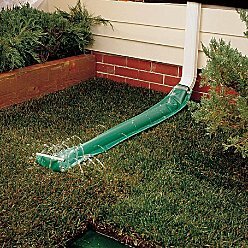 Gutters allows the water to hit the ground without digging up your lawn, your foundation, or causing costly repairs to your foundation. The problem comes in when people don't clean out the gutter and the entire purpose is defeated. For some, the problem is heights. With so many people falling off ladders and other simply afraid of heights, one of the main reasons people don't clean them out is fear. There are rain gutter cleaners you can use that reach up for you (while you stay on the ground) and do the job. These are extension rakes designed to fit into the well of your rain gutter allowing you to sweep it clean with ease. You can also use foam filters you can put in the top of the gutter that stop the leaves and twigs from getting inside (while allowing the rain water to fall in and drain out. You can see examples of these on the right of this text). For porches you can use rain chains/cups that diffuse the falling water (to protect your wood deck, for example) that also look pretty cool. Specially designed for 5inch and 6 inch Half Round Gutters. Classic copper tulip rainchain found in Japanese gardens. An alternate to traditional downsputs. Some of the advantages they report are 100% debris efficiency, ease of installation, visual appeal from the ground, sturdiness and pest resistant. The ease of installation means that most people can install the product themselves using their easy to follow installation instructions. The Leaf Relief system uses solid aluminum construction which means you don’t have to worry about rusting, wear or painting after installation. It's backed it up with a 10-year limited warranty and won't fly off in high winds (although the leaves and twigs will as they aren't buried in the wind proof well of the gutter!). This is not an elective to add to a home, it's essential to have if you like your foundation! Most homeowners understand the value of a good drainage system for their home via rain gutters, but when trying to cut corners on their home budget, most homeowners elect to wait on the installation of a gutter system. Many times, gutters are seen as something that can be added on later when they're better able to afford the cost of rain gutters and the installation. Unfortunately, what happens all too often is that a year or two (or more) passes before they actually get around to installing this much needed protection. Over this time period, rain and snow may have already wreaked havoc on the home's siding, windows, landscaping and foundation. This could mean hundreds of additional dollars in damage that must also be repaired (beyond finally installing the rain gutter to avoid further damage!). The amount of trees in the area. 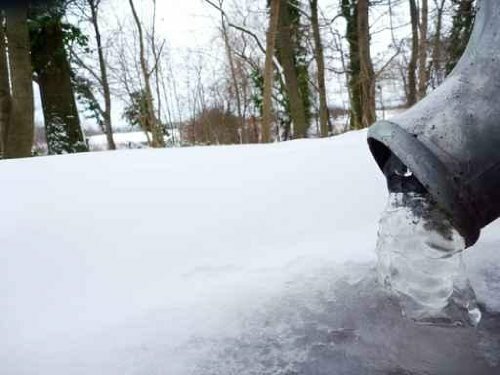 If your area experiences extreme changes in climate such as rain, snow and ice, the gutter system you chose would likely be very different from someone in a more temperate region of the country with few trees and low precipitation. This is typically where the material used in your gutter system becomes most important. 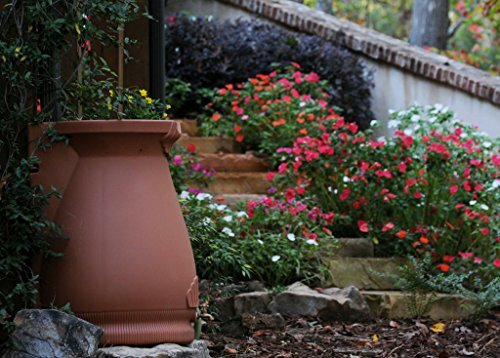 The most popular material used for gutter or gutterless systems is Vinyl. Vinyl's popularity is commonly due to the fact that their ease of installation means that most homeowners can perform the task themselves and avoid spending money on labor. In addition, Vinyl gutter systems tend to retain their color and flexibility better than other materials as well as resist impact damage and resist rust and corrosion quite nicely. While Vinyl gutters tend to be the least expensive option, costing between $3.00 to $5.00 per linear foot installed, they can often be the least durable and susceptible to extreme temperatures. If you live in an area where the weather is generally mild, vinyl is great, but if you live where it gets to below 0 temperatures or in the negatives or on the opposite side of the spectrum it gets to 120 degrees in the summer (consistently), or winds are high and strong- you may want to look into the next one I'll discuss- Aluminum. 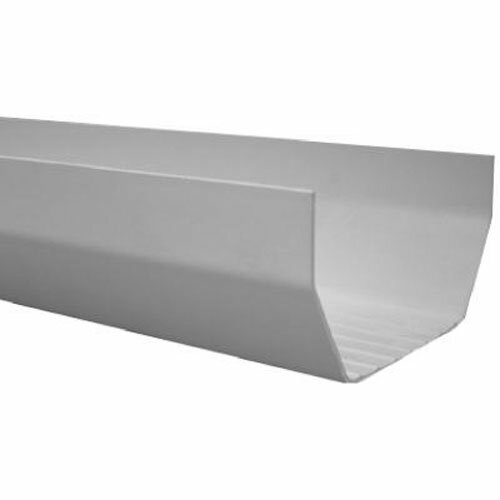 Another popular material for gutter drainage systems is Aluminum. While it isn't quite as impact resistant as vinyl, its color tends to hold up to weather changes nicely and is also a bargain at $4.00 to $8.00 per linear foot. For individuals who need to keep the cost of rain gutters to a minimum, but don't want to sacrifice durability for price, this material may be your best option. Some of the more expensive options would be stainless steel, galvanized steel and copper drainage options. These materials are often chosen for their improved durability and visual appearance, but they can cost upwards of $15.00 per linear foot and often require professional installation. One of the final variables a homeowner might need to consider when deciding on a home drainage system is whether they want traditional gutters or a gutterless system. Where traditional gutters must be cleaned at least once a year (many times up to 4 times a year), gutterless systems are designed to prevent debris from entering the gutters and creating drainage problems. 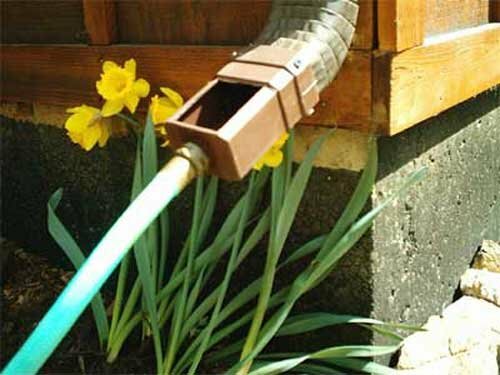 Keep in mind that the bottom portion of your drainage pipe can also be a problem if it's not diffusing the water properly. The area where the water comes out is often terminated on a concrete slab designed to funnel the water but disperse it as it falls. If you don't have this concrete in place you should take some precautions. Attaching a concrete diffuser doesn't have to be lame. 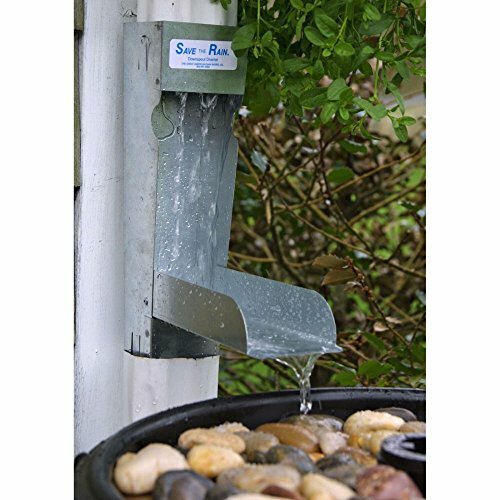 There is a great looking piece you can get on Amazon called the Gothic Medieval Gargoyle Gutter for drain spout or rain gutter. You can see this to the right in all it's beauty. Cleaning gutters can be a nuisance and very often, a time consuming and tedious task. Typically done by most as a maintenance task in the fall, it is a chore that many face with dread and trepidation. What most don’t realize is that they should probably be cleaning their gutters even more often than that; perhaps 3-4 times a year in fact! As if the chore wasn’t daunting enough, the necessary use of a ladder to complete the job can often introduce safety concerns. For those of you who are tired of facing this task on an annual or semi-annual basis, gutterless rain gutters may be the answer you have been looking for! Homeowners understand the importance of having rain gutters. They are crucial to protecting your home’s siding, windows, doors and foundation from water damage, but the cost can sometimes put a homeowner off. One thing that should be considered when deciding between regular gutters and gutterless rain gutters is whether you are going to have to pay someone to clean regular gutters 3-4 times a year or whether you are going to attempt the dreaded chore yourself. If you plan on hiring someone to do the work, that should factor into the cost of installing regular gutters over gutterless systems. When they crunch numbers, most people see that gutterless rain gutters are well worth the investment. 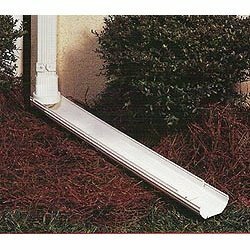 Gutterless rain gutters operate the same way as the in roof version but it's located at the other side of the problem area. The gutterless system technically has a gutter but it works instead by catching the rain as it falls off the roof into an above ground gutter set up and stores it in a bunch of plastic containers. You can have this drip out slowly so it won't damage the foundation. 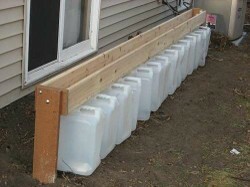 Some build these on wood shelves so the water can then be sprinkled over a garden safely to recycle the water. Below is a picture of what two versions look like. The second version is simply a raised plank that takes the waterfall beating then drains the water out protecting the foundation. I hope you found this helpful and informative. I've included plenty of resources to help you find what you need. Good Luck! I love that rain capture system. I hate to waste water. Your welcome Katie :) I especially like the flower pot and Gargoyle footer, but preserving rain water is a really good idea... Thanks for commenting!